A2P – A French certification body. A.B.P. – Anti-blow pipe, a term used to describe a construction technique to prevent attack by heavy duty heat cutting equipment. This is most commonly achieved by sandwiching a thin layer of copper in between to thicker layers of steel. A.E.D. – Anti-explosive device, another term to describe a relocker. Active relocker – A device that enhances the locking of the safe and is triggered by an unauthorized or attempted opening or breach. An active re-locker is usually directly connected to the locking mechanism and “actively” moves with it during openings. Aggregate material – Material used to fill the body and door of the safe, usually high MPA concrete or similar. AIS – The Association of Insurance Surveyors is a trade organisation of UK insurance surveyors. They produce an annual list of all safes known to have been sold in the UK (both in and out of production) and apply a cash rating to them. This list is used by many of the UK’s insurance companies to apply cash ratings to safes. AIS also give a special stamp of approval to safes that have been independently tested/certified to European standards by a reputable organisation; these organisations are currently ECBS, VDS, SBSC, CNPP/A2P, IG/ICIM & LPCB. Anti-drill plate – A special hardened plate that protects key areas of the safe, usually the lock and bolt work, from drill attacks. These can be made of several different materials including manganese steel and stainless steel. Anti-drive spindle – A design that prevents the drive spindle (this is the bar that connects the dial on the front of a safe to the lock body) from being driven into the lock to remove the lock or give access to the lock workings. Anti-fish plate – See Baffle. Anti-jack hinges – A hinge design that makes it difficult to jack a safe off the floor. Audit trail – A feature on some electronic locks which allows the user to see a history of events. These vary in the detail that they give and the number of events that they will record. They are typically used in commercial situations to help guard against internal fraud. Biometric lock – An electronic lock that uses biometric data to allow access. Currently for safes this usually means fingerprints but, palm vein recognition, iris recognition, voice recognition, facial recognition and signature recognition are all possible alternatives. Back pan – A sheet that is fitted to the back of the safe door to hide and protect the safe’s lock and bolt work. Baffle – A plate fitted inside the deposit or posting slot to make the unauthorized removal of valuables difficult. Bolt strap – The moving steel bar to which the safe’s bolts are attached. When the handle is turned this slides to engage / disengage the bolts. Bolt work – The mechanism that moves the bolts of the safe from the open to locked position and back again. Bouncing – A term used to describe an action used to open cheaper, solenoid operated electronic safe locks. BS7558 – A British standard for gun cabinets. Cash in transit / CIT – A term used to describe the movement of cash in a physical way. CIT companies are used to collect and deliver cash to banks, retailers etc. Cash rating – A term that indicates what an underwriter will insure the contents of the safe for and can usually be multiplied by 10 times for jewellery. This means that a safe with a £1000 cash rating would be suitable to store £10,000 worth of jewellery. Cash ratings can therefore also be used as a guide to the security level of the safe; the higher the rating, the more secure the safe is. CNPP – A well respected French test laboratory. Coffer – A separate compartment inside the safe that locks independently from the main door. ‘Com’ lock – A slang term usually used to describe a 3 or 4 wheel mechanical combination lock. Composite – A security barrier made up of layers of different materials or a mixture of different materials and usually used in between the inner and outer walls in safes. This is a type of infill. Cracking a safe – A slang term used to describe opening a safe by methods other than the key or combination. are a type of freestanding safe, usually smaller in size and in the middle to lower security categories. Day safe – A low security safe, often a deposit safe, used to store cash during the daytime. The contents should be banked each day or moved to a higher security safe overnight. Dead bolts – Fixed bolts on the hinge side of the door. These prevent the door being removed in the event that the hinges are cut off. Dead bolt lock – A locking mechanism that requires the lock cylinder to be physically rotated by the user. With electronic safe locks this is usually achieved by turning the keypad to drive a spindle which in turn rotates the lock cylinder. Dead relocker – Same as Passive relocker. Deposit drawer – A term used to describe a type of deposit system. A drawer (which can be lockable or not) is pulled forward to reveal an opening for packages. On sliding the drawer closed the package is deposited into the safe. This is usually the most secure form of deposit safe. Deposit safe – A safe into which people can insert items without having access to the main door. Typically these are used in retail stores so that staff can deposit cash but only managers or CIT staff can retrieve it. Dial check – A lock that prevents the dial being spun on a mechanical combination lock. Direct drive lock – Same as Dead bolt lock. Dogging bolts / dog bolts – Same as dead bolts. Double walled safe – A safe that has two walls, i.e. an inner and an out layer. The gap inbetween the walls is often, though not always, filled with barrier materials such as concrete or rock wool. Door pan – Same as Back pan. Drive cog – A cog which is at the centre of and connected to the bolt work and into which the spindle from the handle connects. When the handle is turned this cog drives the bolt work. Drill protection – Same as anti-drill plate. Drop test – Part of some, usually well regarded, fire tests. A drop test involves letting a heated safe fall from a designated height the idea being that this replicates what could happen to a safe located on the first floor of a building when the floor burns away. The safe is often dropped onto hard debris, piles of bricks etc., and to pass the test it must remain intact with the door shut. Dual lock(ing) – Has two physical locks on the safe. Dual user – Requires two people to open the safe. This is achieved either by having two physical locks or, with some electronic locks, requiring two different user codes to be entered. Duress code – A special code input into a digital combination lock that activates a remote alarm and/or notifies a remote monitoring station of a duress situation. Usually the code will still unlock the safe so that the assailant on site will be unaware that the user has activated the alarm. ECBS – Europe’s leading safe certification body and recognised by all of the UK’s major insurance companies as a trustworthy test certificate. Emergency lock – A back up mechanical lock that will open the safe in the event that the main electronic lock fails. EN1143-1 – A European attack test standard for Safes and Strongrooms. There are various grades within the standard from 0-XIII. The higher the grade, the higher the security level. EN1143-2 – A European attack test standard for Deposit Safes. This standard includes a fishing/extraction test through the deposit mechanism, in addition to the same attack tests performed under EN1143-1. EN1047 – A European fire test for safes and data rooms. This is the most rigorous of the European fire safe standards. There are two different time periods that products can be tested to - 60 minutes & 120 minutes. You can also test for different types of materials - paper (P), computer data (D) and Diskettes (DIS). EN14450 – A European attack test standard for home safes and cabinets. This is a lower standard than EN1143-1. EN15659 – A European fire safe standard. There are two different time periods that products can be tested to – 30 minutes & 60 minutes. This test only covers the protection of paper, not computer data. This is a slightly lower standard than EN1047-1 because it does not include a drop test, nor a soak out period. ESSA – A world-wide trade association of safe manufacturers and distributors. bodies who have signed a multilateral agreement to moderate each other’s’ work and ensure that the various European safe standards are applied equally and fairly across the different institutions. 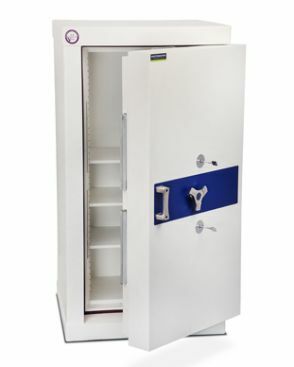 Euro grade safe – Refers to a safe which has been tested and certified to the European standards for testing safes and vaults, EN1143-1, EN1143-2 and EN14450. Eurosafe UK – A UK trade association of safe manufacturers, distributors and re-sellers. One of its main aims is to promote the use of good quality testing and best practice. External (battery) power point – A terminal on the keypad of an electronic lock that allows the opening of the safe in the event that the regular power source has failed. This can entail holding a battery directly onto the terminal or plugging in a pre-supplied battery pack. Fingerprint lock – An electronic lock that is opened by the placing of a pre-registered finger(s) onto a special scanning device. Fingerscan lock – This describes a particular type of fingerprint lock, whereby the finger is swiped over a scanner, rather than placed onto a screen and left static for a few moments. In theory a fingerscan lock is more secure because it does not risk leaving a trace of the fingerprint on the screen. Fire safe – A safe that is primarily designed to protect the contents against damage by fire and maybe water. Most, but not all, fire safes only offer limited security protection. Fixing bolts – The bolts used to secure a safe into position. Fixing holes – The holes in a safe through which the fixing bolts pass to secure the safe into position. Flocking – The creation of a soft, velvet like finish, usually to the interior surface of the safe. The finish is created by applying adhesive to the metal, followed by special electrostatically charged nylon or rayon fibres. Available in a variety of colours and differing levels of softness, a flocked interior helps protect valuables against scratching as well as giving a more luxurious appearance. Flush fitting – Adjoining surfaces / items are level with each other. In safe terms it is generally used to describe a situation in which one or more of the door, handle, hinges and keypads are all in line with nothing sticking out proud of the rest. This can be important information if locating a safe within a confined area such as a cupboard. Four way moving boltwork – This means that the safe has moving boltwork (driven by a handle or directly by a key or keypad) on all four sides of the door. Free standing safe – A safe that is not fitted into a wall or floor, but rather on top of it; so that it stands free within a room. These should usually be anchored with fixing bolt(s) to the floor and/or wall to prevent removal. Full time and date stamp – Refers to a feature on some electronic safe locks, whereby all events recorded on the audit trail have a true time and date logged against them. Gas attack – This describes a particular form of safe attack in which gas, usually oxyacetylene, is pumped into a safe or ATM and then ignited to blow off the door. It is extremely dangerous but is becoming more prevalent. Glass plate – A sheet or piece of tempered glass that protects the vital parts of the locking mechanism and which is usually attached to a passive relocker. In the event that the glass plate is broken the relockers will engage. Gloss finish – A high quality, polished paint finish similar to that of most motor vehicles. Graded safe – Usually this means the same as Euro Grade Safe. Gun Cabinet – A security cabinet designed to house weapons. Gun Safe – A safe designed to house weapons. Usually these offer a higher level of protection than a gun cabinet. Hard plate – A piece of metal or material made of or treated to resist penetration, usually by drill bits. ICIM – A well respected Italian certification body. Indirect drive – A drive mechanism to make manipulation more difficult. Infill – Describes materials placed in-between the inner and outer walls of a double walled safe. Internal hinges – As the name suggests this means that the door hinges are inside the body of the safe. This gives a flush finish which is often more convenient if safes are located in cupboards. However, it also means that usually the door can only open to 90 degrees, rather than 180 degrees on externally hinged safes. Inner box – This usually refers to the removable inner compartment of a safe deposit box. Jewellery rating – A commonly used term to indicate the value of jewellery that will be insured by the underwriters overnight, when stored in a safe. This is commonly, though not always, equivalent to ten times the cash rating of the safe. Jewellery drawer – A special drawer inside the safe, specifically design to house jewellery collections. These would commonly be lined with flocking or a soft material to protect the jewellery. Key safe – A safe specially designed to securely store keys. Leading edge – The front edge of a safe door (i.e. the corner edge of the door on the side where the horizontal bolts are located). This is often the edge of the door where pry attacks are attempted. Limpet – A device which is attached to the outside of the safe and also to an intruder alarm system. When the limpet is attached and armed then any attempt to remove it will trigger the alarm. When the alarm is off though the limpet can be removed. Most commonly screwed and glued to the safe door they are often fitted in a position that also prevents the safe handle from being turned when the limpet is in use. Liner – The removable inner compartment of a safe deposit box. Live relocker – Same as Active relocker. Lock on back case (LOBC) – A way of ensuring that an unauthorized person cannot gain entry to the lock workings and work out the combination for later use. Lock out mode – A sleep mode that some electronic locks enter into after a number of incorrect code entries. This is designed to prevent lock manipulation. Locked open – Describes a safe that has a lock or bolt work problem and where the door is in an open position. Locked shut – Describes a safe that has a lock or bolt work problem and where the door is in a closed position. Lock bolt – The bolt on a lock that engages with the bolt work to keep a safe locked. LPCB – The British test and certification body. Manager code – An access code for an electronic safe lock that also carries additional privilege rights, e.g. creating and deleting user codes, setting time delay periods etc. Manganese plate – A special type of hardened steel plate, designed to protect key areas from drill attacks. Master code – The ultimate access code for an electronic lock which carries full privilege rights allowing the holder to alter all parameters of the lock. In commercial settings these are often held by head office or regional management staff. Manipulation – A technique, which utilizes inbuilt tolerances of a combination lock to determine the combination. Mechanical combination lock – A dial operated lock that requires the correct sequence of numbers (usually 3-4) to be entered by spinning the dial left and right in a particular order. This aligns wheels (usually 3-4) inside the lock that in turn allows a plunger to fall and the lock to open. They can be tricky to use for those who are unfamiliar with them. Motor driven lock – An electronic lock that driven by a small motor. Usually used on better quality and higher security locks. Mounting plate – Usually describes the metal plate onto which the safe lock is mounted. Multiple user codes – A term used to describe a feature on an electronic lock where more than one user code is available. NTFIRE 017 – A Nordic fire safe standard. Similar too, but not quite as rigorous as EN15659. One-time code / OTC – A one-time code is a user code for electronic locks that can only be used to access the lock once, after which it will no longer work. One-time codes are commonly issued to the likes of couriers, CIT employees and branch staff who may not normally be allowed access to the safe. These codes are generated by algorithms within the locks software. create a concentrated and very hot cutting point. It can be very effective against single steel walling structures. Override key – A back up key that will open the safe in the event that the main electronic lock fails. Palm Vein recognition – A form of biometric access available on higher tech. safes and safe deposit boxes. The technology reads the vein patterns inside the hand to recognise each user. Panic room – A special type of strong room / vault to protect people, rather than valuables. Usually located within a domestic property to provide a safe haven in the event of attempted kidnap or robbery. They can also be found in some high risk commercial situations. Passive relocker – A device that enhances the locking of the safe and is triggered by an unauthorized or attempted opening or breach. A passive re-locker is usually independent of the boltwork and sits “passive” until an attack takes places. PIN code lock – An electronic lock that is opened by entering a Personal Identification Code, usually a special sequence of numbers between 3-10 digits long. Plate safe – A safe that is made from a single skin of steel. Pry attack – An attempt to force open a safe by prying the door open, usually using a crowbar. Rebar – Sections of steel bars or angles that are inserted within the infill material used between the inner and outer walls of a safe. Rebar strengthens the structure of the safe and prevents entry by slowing down drilling, cutting and burning attacks. Redundant locking system – A term to describe a feature in high end electronic safes locks, whereby a secondary set of circuitry and motors are employed to act as back-up in case the primary systems fail. Rekeyable lock – A key operated lock where the levers inside can be changed to stop the operation of the original key and allow the operation of a new key. This means that if keys are lost or stolen they can be made obsolete without the need to fit a new lock. Relocker – A device, which relocks the safe either after or during an attempted breach. Room safe – Usually used to describe a small cupboard safe suitable for use in Hotel bedrooms. These usually offer a low level of security and include some kind of master key or code, so that the hotel management can gain access if required. Rotary deposit – A term used to describe a particular type of deposit system. A drum with a cut out section for inserting packages is located in the top or front of the safe. The cut out section is accessed by pulling a lever or handle which rotates the drum to the correct position.The lever or handle is then pushed back to rotate the drum back and deposit the object. This design makes fishing difficult. Security rating – Another term for cash rating. Security safe – A safe designed to protect valuables from theft. Solid explosive attack – This describes a particular type of safe attack using solid explosives. Similar to a gas attack the explosive is inserted into the safe and ignited in an attempt to blow the door off. Smoker – A term given to safes that were fitted with gas tubes inside the body and or door. They were discontinued due to safety concerns for locksmiths and safe technicians who had to drill into them. Safe – A strong box with a complex lock, designed to protect valuables against fire and /or theft. Safe Cracker – Someone with intimate knowledge of the working of a safe or vault. Safe custody box – This usually refers to the removable inner compartment located within a safe deposit box. Safe deposit box – A safe custody box, usually with dual control locks. They are typically used for storing valuables away from the owners’ premises, usually in banks or private safe deposit centres. The customer controls one lock and the bank / deposit centre the other, ensuring that both must be present to access the contents. Safety deposit box – Same as Safe Deposit Box. SBSC – A well respected Swedish certification body. Secured by Design – A UK Police approvals scheme for security products. Security cabinet – A steel cabinet with a complex lock and possibly boltwork. Usually consisting of a single steel wall, ranging from 1mm-6mm thick. Soak out period – This refers to a part of some higher quality fire tests. In basic fire tests the safe is placed into a furnace and heated to the designated temperature, once this has been achieved the test is over and you know whether the safe has passed or not. With higher quality tests once the safe must continue to be heat resistant internally after the furnace has been switched off and until it returns to room temperature. The period of time after the furnace has been switched off until the safe has cooled down is known as the soak out period. The relevance of this is that the internal temperature inside a safe will often continue to rise after the heat source has been extinguished as heat within the safe walls will still transfer to the cooler air inside. Sold Secure – A UK test laboratory run by the Master Locksmiths Association (MLA). Solenoid – An electromagnetic device used in electronic safe locks and which acts as a locking bar to keep the safe locked. These are usually used on cheaper and lower security locks. Spy shield – A physical shield that is fitted around the dial of mechanical lock and / or the keypad of an electronic lock to prevent people from seeing user codes as they are entered. Strongroom – A secure room to protect valuables from theft and/or fire. Usually offers a very high level of security. Strongroom door – A secure door with a complex lock, usually offering a very high level of security. Swing bolt lock – An electronic safe lock that uses a spring system to hold the bolt in place, allowing retraction by applying force to the bolt itself after a correct user code has been input. In practice, this means that unlike a direct drive / dead bolt lock, the keypad does not have to be turned to open and lock the safe. T.D.R. – Torch and drill resistant. TDR Safe – Torch and drill resistant safe. Thermal Link – A method of attaching a relocker to a vital part of the safe that will activate in the event of a thermic attack. Thermic attack – A particular type of attack, using a heated tool that melts the walls / door of the safe. These attacks can be quite effective but come with a high risk of damaging the contents of the safe, as well as setting fire to the surrounding building or even the attacker! Thermic / Thermal Lance – A device of immense destructive power that in theory can cut through most safes quickly. In practice they are very dangerous to use and can only punch holes in the safe, rather than cut straight lines. Time delay lock – A lock that once set or activated will delay the opening by a determined time, usually between 1 and 99 minutes. These are very effective to deter the threat posed by armed hold up. Time lock – A mechanical or electronic lock that will only allow operation of the safe at a preset time(s). Time window – Refers to the period of time when a time lock / time delay lock can be opened. Top shot – A term used by engineers to describe a forced entry method whereby they access the inside of the safe door by drilling a vertical hole into the safe from the top. Torch attack – Same as thermic attack. Treasury cabinet – See Coffer. Tumbler – An integral part of a combination lock, which we refer to as a wheel. Most quality combination locks have 3 or 4 wheels. Two way boltwork – This usually means that there are moving bolts on the leading edge of the door and fixed (dead) bolts on the hinge side of the door. There are no bolts on the top and bottom of the door. UL – Underwriters Laboratory is an American test and certification body. UL 72 – A US fire safe standard. Under floor safe – A safe which is designed to be fitted into a recessed hole in a concrete floor. User code – A code programmed into an electronic or mechanical combination lock that the safes owner uses to open the lock. Vault – Same as Strongroom. Vault Door – Same as Strongroom door. VDS – A well respected German test and certification body. V-Trap – A term used to describe a particular type of deposit system on a safe. The trap can be pulled open, giving you a space into which you can place a package. When the trap is closed the package will fall into the safe. The V shaped trap (from where it derives its name) closes off access to the safe until it is closed, making a fishing attempt more difficult. Wall safe – A safe which is designed to be fitted into a recessed hole in a brick or masonry wall. Wrong try penalty – A period of time when an electronic lock becomes inoperable following a number of incorrect entries. 3 wheel combination lock – Same as mechanical combination lock. 4 wheel combination lock – Same as mechanical combination lock (higher security than a 3 wheel combination lock).